X-SPEX, the specialist for industrial video systems, developes and produces OEM components for devices with tasks for video visualization and recording. 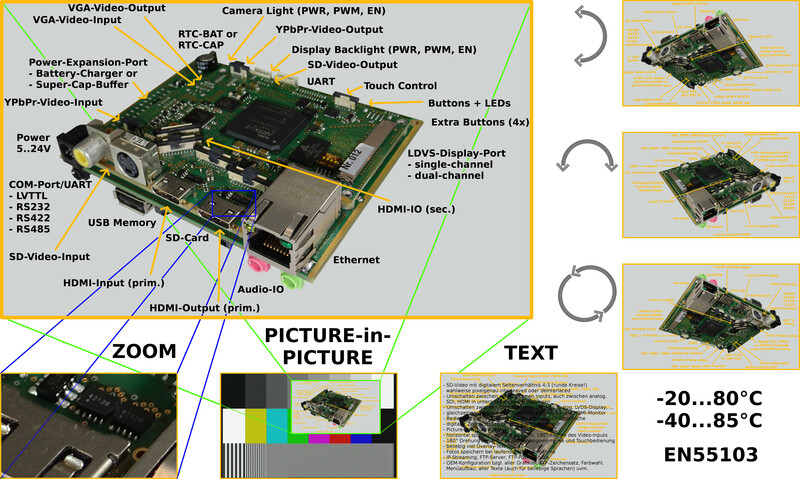 The software of the DIRIS video recorder boards has been completely reworked. OEM configuration of any graphics, TTF fonts, colours, menu structure, all texts (for any language) and much more! The video processing happens seperately from the recording. Thus it is possible, for example, that you can see a zoom segment as well as overlays of previous recordings on your display, while either exactly this view or the unedited, entire camera input is recorded. to the product requirements of our customer. Thereby the DIRIS boards offer an ideal combination of reliability and time to market of a standard product with flexibility, similar to a customer specific design. X-SPEX offers OEM components capable of recording and playback of videos, designed for industrial and medical applications. For us the industrial quality, the simple usage, versatile configuration and, if demanded, the customer specific variations of our products have the highest priority. The in January 2003 founded company develops hardware and software directly in Berlin. The assembly of the DIRIS products is ensued with different partners from all over Germany.